If you're looking at that cute little furball and wondering just how big he's going to get, you're in good company. Almost every puppy owner asks themselves this question - sometimes before they pick out their new pup, more often afterwards! The thing is, no one can give you any guarantees about how tall your pup will be as an adult, or how much he will weigh. but you do get some clues! If you've brought home a purebred puppy then you've got a general idea of the breed's adult size. But if Fido is a mixed breed puppy, then the element of 'surprise!' is going to be much greater. Every single puppy is unique, and within the same breed (even within the same litter) there can be a noticeable difference in size between siblings. Don't assume the pup who is the smallest at 6 or 8 weeks, is going to be the smallest as an adult. The size of a very young puppy is not an accurate indicator of adult height/weight! Genetics obviously play the biggest role in determining the adult size of any pup, but health and diet also have an effect. Dogs come in a wider variety of sizes and appearances than any other animal on our planet! Of course this huge difference in size (think Great Dane and Chihuahua! ), means that there is no 'one-size-fits-all' calculation for estimating a puppy's adult weight. But, there are some general guidelines that can help. But tiny and toy breeds develop at a faster rate and reach maturity much earlier than the large or giant breeds. 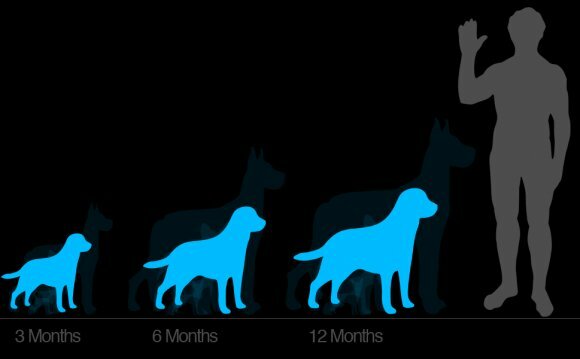 The earlier, rapid growth usually starts to slow down considerably once your puppy reaches 65% of his adult height (between 4 and 6 months of age in medium to large breed pups). In addition, studies done in the UK indicate that you can expect a small or medium breed puppy to reach 99% of it's adult weight somewhere between 9 and 10 months of age. Large or giant breed puppies take longer to mature, and don't reach this stage until they're at least 12 - 18 months old. Puppies from breeds at the top end of this scale (Great Danes, Mastiffs, Rottweilers etc. ), are unlikely to really be 'finished growing' until they're 2 (or even 3) years old. A pup reaches his full height before he reaches his full weight. For example, at 4 months old most dogs will only have reached about 30% of their adult weight, but 60% of their adult height. This variation puts their bodies 'out of whack' and is largely responsible for what I call the 'puppy uglies'... which is especially noticeable in large and giant breed pups. I have one big-boy Rottweiler who looked like a 'bobble-head' for pretty much the whole of his second year of life! He had a huge frame, massive head, and was on the top end of the height scale for a Rottie, but he was fairly 'slender'. hence the bobble-head effect. This pup actually didn't 'grow into' his bone structure until he was two and a half years old. Now he weighs around 135lbs and is a big, muscular (lap) dog - not fat or overweight though thanks to his bone structure. I've not seen quite such a slow puppy growth rate in any of my other Rottweilers, so this is a bit of an extreme example, but shows you what I mean. How Big Will Fido Get? There are lots of different methods of calculating puppy weight estimates, but none of them can predict exactly how much little Fido is going to weigh when he's all grown up. However, they will give you a rough idea of how big your puppy is going to be. On average, a puppy should double it's birth weight by one week old. Followed by a consistent 5% - 10% daily increase. Again for medium to large breeds, at 6 months old, your puppy may weigh around two-thirds of his adult weight. Giant breeds are more likely to be just about half of their adult weight at this age. You can get puppy weight estimates for tiny and toy breeds, by doubling the weight of your pup at 6 weeks, and then doubling it again to get an idea of his weight at maturity. If you're the proud owner of a mixed-breed dog (or one who you were told was purebred, but you don't have papers and are beginning to have doubts about), there are some simple dog dna testing kits that you can buy online and use at home.